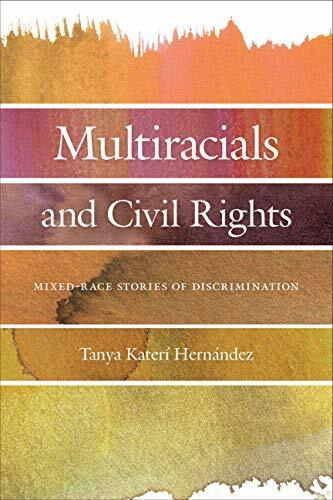 In Multiracials and Civil Rights, Fordham law professor Tanya Hernandez demonstrates that discrimination perpetrated against blacks also targets mixed-race persons, called multiracials. Contrary to popular expectations, multiracialism has not alleviated racism. Deviations from the hundred-percent whiteness (a racial myth) continue to inform social constructions of race, racial awareness, discrimination, and the application of civil rights laws. Historically, the one-drop rule has required that a person with any degree of black ancestry must identify solely as black. With diverse immigration and interracial procreation, multiracialism is on the rise. Since 2000, multiracials are free to identify with more than one race. Yet such is the sociology of racism that any fraction of blackness, visible or hidden, reduces multiracials into black persons, discounting their other racial traits. The hundred-percent whiteness paradigm formulates and protects the white privilege, a source of unearned advantage, and offers measly concessions to any dilution of whiteness. Therefore, non-whiteness is potentially subject to racial discrimination actionable under law. Partly for this racial dynamic and partly in view of litigation outcomes, Professor Hernandez argues that the civil rights laws are adequate to protect multiracials against discrimination and disagrees with legal scholars who wish to reform the laws to recognize multiracials as a distinct category. Written for general readers in a narrative form, the book tells the stories (borrowed from lawsuits) of multiracials claiming discrimination in various fields, particularly employment, education, public accommodation, and the criminal justice system. The author’s own family story of multiracial torments, originating in Puerto Rico and continuing in New York, is composed with exquisite literary flavor and captivating frankness in the Preface. In the rest of the book, however, the narrative is laced with legal jargon, possibly baffling readers not armed with the knowledge of the law. In some chapters, the narrative descends into professorial quibbling over the niceties of legal doctrine. In a couple of chapters, the writing embraces the classical law review style beyond the comprehension of general readers. Still, the book moves from chapter to chapter boring in the author’s central theme that the existing civil rights laws function satisfactorily for handling the discrimination claims of multiracials. The book examines a slew of civil rights cases, won and lost on grounds of racial discrimination. Most cases involve some degree of black ancestry. It is well known in legal circles that very few racial discrimination lawsuits bear fruit for the claimants. Losing is the norm. In each case, win or lose, the author argues that the claimant would not be better off if there were a distinct protected category of multiracials. However, agreeing with the author’s central thesis is unnecessary to learn from the cases analyzed with superb skill. The ensconced racism against blackness is not simply optical but also cerebral. For example, Jill, a “white” multiracial continued to work at Champs Sports in Texas without any problems until the manager “discovered” her black lineage when Jill’s darker skinned relatives and friends started frequenting the store. Soon thereafter, hostility commenced. Jill sued, obtained a court-appointed lawyer (thanks to the judge), and reached a confidential settlement. No new multiracial categories are needed, says the author, because the courts are sensitive to the fact that mere knowledge of someone having black ancestry may trigger actionable hostility and prejudice. Anti-black racism acquires even more complexity when color is injected into the race. In the job market, for example, light-skinned African Americans are more likely to be favored over black-skinned African Americans. Yet the book offers cases in which light-skinned African Americans claim workplace hostility conducted not by whites but by dark-skinned African Americans. These patterns of behavior are known to the judicial system. The courts are sophisticated to capture the various nuances of multiracial discrimination, asserts the author, and provide relief under the existing civil rights laws. Sometimes, the official denial of blackness could be a ground for multiracial discrimination, a case scenario that the author believes can be successfully litigated under the present laws. For example, a prison facility prone to interracial violence may be lawfully segregated, housing black inmates together but separate from white inmates. Jared, a Creole classified as white by the prison authorities, was housed with white inmates. However, fearing personal safety, Jared petitioned to be housed with non-white inmates. His petition was denied and Jared sued the prison authorities. The Court had no problem with his multiracial discrimination claim, even though he lost the case on other grounds. In the final two chapters, Professor Hernandez contests the various scholarly arguments in favor of changing the civil rights laws for recognizing a distinct category of multiracials. Two academic arguments favoring the change are most intriguing that the readers would enjoy regardless of conflicting perspectives. The author does not win these arguments but neither does she lose them. First, the existing laws require multiracial claimants to disclose their racial makeup to assert racial discrimination. This inevitable disclosure, say fractional blackness, for obtaining relief breaches the person’s racial privacy. It should be enough to say that “I am a multiracial facing discrimination” without any further racial revelation. Multiracials lose existential integrity, the argument goes, when they must expose their racial ingredients to assert discrimination. A distinct multiracial category protects racial privacy. Second, related to racial privacy is the concept of racial performance. A mixed-race person may choose one racial identity over the other and perform the selected racial identity through various means, including the choice of music and dance and the way “one speaks, styles one’s hair, makes wardrobe choices.” For example, a person with only fractional whiteness may choose to “act as white.” If so, racial discrimination will be a negative reaction to racial performance rather than how the society expects a multiracial to behave or not to behave. The recognition of multiracials as a distinct category confers existential freedom on mixed-race persons and frees them to perform a freely selected racial identity. A multiracial is free to act black or white. This existential freedom to racial performance undermines the social construction of racial categories and the associated expectations of behavior. In opposing the arguments behind racial privacy and racial performance, Professor Hernandez is concerned more with “material equality” than “feelings” or even “personal dignity.” The civil rights laws, she reminds the readers, aim at correcting race-based material disadvantages, such as loss of job, denial of effective education, mistreatment in prisons. Feeling good about one’s preferred racial identity, much less commanding others to respect such preferences, is not the objective of anti-discrimination laws. The book offers sturdy understanding of many arguments supporting and disfavoring a separate category for multiracials. Even though Professor Hernandez argues her position fervently, the readers would enjoy the debate that she constructs with intellectual honesty. The book is a reliable source for lawyers, judges, and law professors not familiar with the civil rights jurisprudence. General readers, with no initiation in law, will learn quite a bit about racial discrimination, civil rights laws, and how academics grapple with theoretical difficulties underlying race relations in the realm of law. L. Ali Khan's most recent book is Contemporary Ijtihad: Limits and Controversies. He is the author of several other books as well as numerous articles and essays on human rights, foreign policy, Islamic law, international law, jurisprudence, comparative constitutional law, the U.S., Constitution, commercial law, legal humor and also creative writing for both legal and academic journals as well as the popular press In the U.S., the Middle East, and the Indian subcontinent. Much of his academic writing is used as course materials in universities around the globe. He is emeritus Professor of Law at Washburn University.